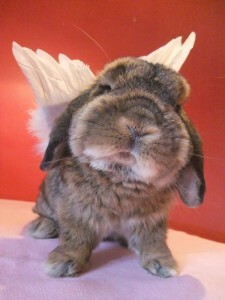 Welcome to Bunny.nu » Blog Archive » What a cute little angel! Boppi the bun is featured on Daily Bunny, do not miss to go there and look at him! He is such a cute little bun! This entry was posted on Sunday, December 20th, 2009 at 8:59 am	and is filed under Bunnies. You can follow any responses to this entry through the RSS 2.0 feed. You can leave a response, or trackback from your own site. Maybe he can come flying here for Christmas? I would love to have such a little cutie coming here for Christmas!